My term at Afghanistan’s graduate school of war. Camp Julien is surrounded by reminders of Afghanistan’s past. The coalition military base--which sits in the hills south of Kabul, just high enough to rise above the thick cloud of smog that perpetually blankets the city--is flanked by two European-style palaces built in the 1920s by the modernizing King Amanullah. Home to Soviet troops and mujahedin during the past decades of war, the now-crumbling palaces are littered with bullet holes and decorated with graffiti in multiple languages. Uphill from Julien is the old Russian officers’ club, dating from the Soviet invasion and featuring a recently refilled swimming pool that overlooks the southern half of the city. The pool is said to have been the site of executions in the 1990s; the condemned were apparently shot off the diving board. Overseeing the center is an American colonel named John Agoglia. The Brooklyn native is both impossibly considerate and, at six feet and 215 pounds, incredibly imposing--a fact compounded by his loud, decisive manner. "No one here is a subject-matter expert in counterinsurgency," he announces to his students on the first day of their course. "If you think you’re an expert, it indicates to me you’ve stopped learning, don’t have an open mind, and you should leave. We’re all students here." His strength, he told me, lies not in creating ideas but in synthesizing them. The result is that Agoglia presides over something akin to the Aspen Ideas Festival of Afghanistan. Sitting around a campfire or in the center’s small, plywood-walled conference room, groups one would never expect to see together talk late into the night about counterinsurgency theory or metrics for measuring the efficacy of development aid. Agoglia’s staff contributes to this vibrancy. His 15 instructors include French and Australian officers, as well as U.S. troops with varied experiences. Their offices are filled with books on counterinsurgency operations and Afghan history--from the conqueror Babur’s memoirs to histories of the British-Afghan wars of the nineteenth century. Julien may not fit the image of an ordinary military installation, but counterinsurgency has long been considered atypical--the province of warrior-scholars like General David Petraeus (who has a Ph.D. from Princeton) or John Nagl (a Rhodes Scholar with a doctorate from Oxford). Indeed, the Army and Marine Corps’ Counterinsurgency Field Manual opens with what has become a popular epigram: "Counterinsurgency is not just thinking man’s warfare--it is the graduate level of war." This more sophisticated style of warfare is now central to Afghanistan’s future. General Stanley McChrystal, who oversees the coalition effort in the country, issued a tactical directive in early July to his forces. It was a striking document that effectively reversed the central theory of the great wars of the twentieth century--destroy the military and the will of the people. Instead, McChrystal told the troops that "we will not win based on the number of Taliban we kill," and he cautioned against using air attacks because they might cause civilian casualties. An alienated population, he argued, would threaten the mission’s success. More recently, McChrystal has identified another tenet of counterinsurgency as a crucial objective in the fight for Afghanistan: improving governance at all levels. As counterinsurgency theorist David Kilcullen has noted, "a government that is losing to an insurgency is not being outfought, it is being outgoverned." Now, President Obama must decide whether to give McChrystal the additional troops he is requesting to carry out this strategy. Before he does, he will have to determine whether he thinks counterinsurgency can truly succeed in Afghanistan. And the answer to that question hinges partly on whether our military can learn this type of warfare, and learn it quickly. "I expect our force to internalize and operate in accordance with my intent," McChrystal wrote in his July directive. "Following this intent requires a cultural shift within our forces--and complete understanding at every level--down to the most junior soldiers." An entirely new mindset is a tall order for a massive bureaucracy. If you want a sense of whether it can be done, there is no better place to visit than Camp Julien--Afghanistan’s graduate school of war. "How many of you have read David Galula’s Counterinsurgency Warfare: Theory and Practice?" Lt. Colonel Matt Galton, the deputy director of the center, asked in his Australian accent. Two hands slowly went up. It was not surprising. Though Galula’s book is a--possibly the--classic starting point for counterinsurgency, it was written over 40 years ago and isn’t required reading. More troubling, when Galton asked how many had read the Counterinsurgency Field Manual, only about five hands went up. This was surprising, given how pervasive, even trendy, counterinsurgency has become in policy circles. In the nearly three years since the release of the Counterinsurgency Field Manual, its authors have gone on to fame, at least in the public policy world: Nagl appeared on "The Daily Show"; Kilcullen is a frequent television commentator; and Petraeus, the lead author of the manual, is now the head of U.S. Central Command--in charge of the military’s operations in the Middle East. But, despite the coaches’ rise to prominence, most of the players haven’t read the playbook. After enlisting in the Army, Lewis served a tour in Kandahar in 2002 and a tour in Iraq. "The Army should be proactive, but we were reactive in Iraq," he said. "We just didn’t know what to do." Lewis is naturally inquisitive and curious; he asked more questions than any other student in the course, and often the hardest and most pointed ones. Now an officer, Lewis had tried to learn more about counterinsurgency, reading on his own, talking to peers about their experiences, and volunteering for courses like this one. But, prior to deploying to Afghanistan, he had little counterinsurgency training, and he found that counterinsurgency still carried a stigma among members of armor and maneuver units, who prefer the straightforward nature of conventional warfare to the nuance and discretion required for successful counterinsurgency. "The challenge for the Army is that the Counterinsurgency Field Manual expresses a mindset--it’s as close as the Army gets to philosophy. And we’re not good at teaching that," Lewis said. "You can tell someone how far the rifle shoots, but you can’t really do the same with counterinsurgency." Still, Agoglia’s instructors must try. On the first day alone, students see dozens of slides, capturing a century of counterinsurgency theory. Some are impossibly complicated. The conflict ecosystem and the support structures for insurgency look like the animal food chain from elementary school biology class--arrows in every direction showing feedback loops, backlash effects, and the interconnections of the social system needed to sustain an insurgency. "Security, governance, and development," Captain Mike Barry announced with the ease and authority of a second-tour officer who now spends his days reading about counterinsurgency. "These are the three pillars of counterinsurgency. This is how you win the population." When groups of students assembled around him during the week, Agoglia frequently told them that governance was the most important of the three. "I’m an infantryman telling you that," he joked, "so it must be true!" Yet, on the first day, many of the students chafed upon hearing that they might have to do what the military calls "civil affairs." "We’re not trained to do governance and development," one young officer said. Another chimed in: "Shouldn’t the State Department and others be doing this? This isn’t our job." Agoglia runs a tight ship and would not let the group move on until the dissenters at least acknowledged his point: "We have limited resources. There aren’t enough people from the State Department or USAID to do these operations. So we have two choices: Either we don’t do it and risk the mission, or we step up to the plate and take on the challenge." The dissenters recognized that they were beat and finally caved when Agoglia appealed to their honor as soldiers. "In my Army, we get the job done," he said. "Whatever it takes." One key tenet of counterinsurgency is that you need to understand the local population. Spending time at Camp Julien made clear that we still have a long way to go on that front. When an Afghan interpreter asked the students during a presentation how many read the local papers, listened to local radio, or had someone translate or brief them on the local news each day, about a dozen (out of 130) raised their hands. In a debriefing session later that day, a group of young officers asked why their commanders didn’t require everyone to follow the local news. Another officer said he had met fellow officers who explained that they were too busy to sit down over tea with village elders in order to build strong relationships; they only had time for official meetings. But the problem runs deeper than just keeping up with local news or having the requisite cups of tea with residents. Instructors at Julien worried about the fear of casualties--particularly the fear of IEDs--pushing troops and civilians to stay on their bases as much as possible. The Counterinsurgency Field Manual rejects this approach, noting, in perhaps its most difficult paradox, that "sometimes, the more you protect your force, the less secure you may be.” In the long run, the security of the base is a mirage: It leaves the population constantly at risk and increases the danger to soldiers whenever they venture out. And it prevents soldiers from understanding the people they are trying to protect. One of the center’s priorities is teaching students tools for quickly understanding a local community. Students use the acronym ASCOPE to identify the Areas, Structures, Capabilities, Organizations, People, and Events in a particular province, district, or village. After my small group did an ASCOPE analysis for Herat province in western Afghanistan, we realized not only how much counterinsurgents need to know about an area but also how little we knew--despite the fact that much of the group was deployed in Herat. Most conceded that they probably couldn’t do an ASCOPE for their home state back in the United States or Europe. How many knew the names of their local politicians or the most important economic and social leaders in the state? How many knew the location and status of the relevant infrastructure--water treatment plants, hospitals, utility providers? Like politics, all counterinsurgency is local. Even the most conscientious efforts to connect with Afghans can sometimes go awry. During my time at Julien, an Afghan National Army general--a soldier throughout the last three decades of war--was invited to the base to give a talk on insurgency. After a 20-minute discussion of the differences between violent and peaceful demonstrations and how the police should deal with them, I saw Agoglia write "WTF? !” in his notebook. The general was in the army, not the police; why was he talking about how to manage demonstrators? I had thought he was describing possible courses of action if the upcoming elections led to protests. But it was nothing so clever. In Dari, Afghanistan’s most widely spoken language, the words for "demonstration” and "insurgency” are similar, and the general’s staff thought the request was for a talk on demonstrations, not insurgency. A minor error in translation, but one that signified the magnitude of the challenge. The professionals at Camp Julien can teach counterinsurgency as well as possible, but in Afghanistan, the lack of local knowledge continually risks disaster. Professors Eli Berman of the University of California, San Diego, and Jason Lyall of Yale were at the base during my time there. Berman and Lyall are part of a team conducting a multi-country study on the relationship between development programs and violence. Throughout the military, development agencies like USAID, and academia, there is a general assumption that economic development reduces violence. The basic idea is that development programs create well-being, and those who are well-off are less likely to join an insurgency. The evidence, however, is largely anecdotal, and no one knows which programs get the biggest bang for their buck. Is it road construction or irrigation projects? Building schools or drilling wells? In an earlier study, Berman (collaborating with Jacob Shapiro of Princeton and Colonel Joseph Felter of Stanford) looked at development spending in Iraq through the Commander’s Emergency Response Program (CERP), a discretionary fund available to military commanders. They found that, prior to the surge, CERP spending was insignificant in reducing violence. If the theory was that spending always improves security, it failed. Only after the surge, with an increased security presence and more contact between U.S. troops and Iraqi civilians, did CERP spending decrease violence. Berman and Lyall are now proposing the gold standard of social-science research for Afghanistan: a randomized experiment. USAID, commanders disbursing CERP money, and development contractors often have to choose which programs to spend their limited resources on. What Berman and Lyall suggest is that they use their discretion in a way that enables the scholars to collect data akin to that provided by a randomized medical trial. Once the programs are completed, Berman and Lyall can crunch the numbers and identify which projects were successful under what conditions. "It’s been a challenge, but we’re making a lot of progress,” Berman told me. The military has been supportive of their efforts. After all, if Berman and Lyall can provide some sense of which programs are working, their research could guide smarter, more effective spending in the future. "It’s not how much money you spend,” Agoglia told me, "it’s how effective the program is in accomplishing the goals. Right now, we only know how much money we spend. 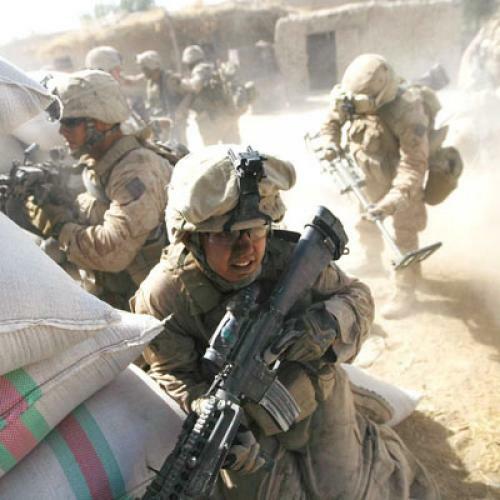 We need these guys to help us measure the effects.” Though Berman and Lyall’s project is promising, it is striking that, after eight years in Afghanistan, no one actually knows which development programs--if any--reduce violence. Over the course of the next six months, the counterinsurgency center at Julien will expand. Yet there will still be a limit to how many troops the center can train at any given time. It’s been almost three years since the Counterinsurgency Field Manual appeared in print and two years since General Petraeus helped make counterinsurgency the most prominent military strategy since containment. But, for all the publicity, too few in the field have truly internalized counterinsurgency. Agoglia and his staff are engaged in a race to make up for lost time--a sprint to change the mindset of the military before Afghanistan deteriorates further. Ganesh Sitaraman is the Public Law Fellow and a lecturer at Harvard Law School. Ganesh Sitaraman is an associate professor at Vanderbilt Law School and a senior fellow at the Center for American Progress.